Lake Como sparkles under the Spring sun. Grand Art Nouveau villas and Neo-Classical palazzos in pastel colours cast their tremulous reflection on the deep blue waters, where swans and ducks vie for fish and attention. Weeping willows dip their leaf-laden branches into the lake, flanked on either side by crimson tulips, Neo-Classical statues and stone urns brimming with pink and red geraniums. Dainty little café tables line the waterside passeggiata, from which narrow cobbled lanes lit by wrought iron streetlamps ascend towards an ancient church and its solitary belltower. Behind all this, the white-capped Alps soar high towards a baby blue sky. Few places can beat the charm and sheer beauty of the Italian Lakes—which is why they have been a holiday destination for two millennia. Roman historian Pliny the Younger was one of the first celebrities to take to the lakes—he had at least two villas along Lake Como’s shores. But the area’s golden age came in the 19th century, when Europe’s great and good all wanted a place by the waterside. Poet Percy Bysshe Shelley and his wife Mary fell in love with Lake Como, which Shelley described as exceeding “anything I ever beheld in beauty.” And Queen Victoria herself visited both Lake Como and Lake Maggiore. The late 20th century brought George Clooney, Sting and Richard Branson, the last in a long list of famous people to be drawn by the lake. As they bought lavish second homes along the shores, they helped put small villages like Laglio (where Clooney has his mansion) on the map. 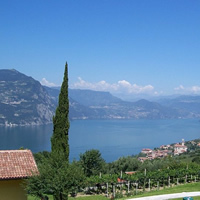 However, while virtually everyone has heard of Lake Como with postcard-pretty Bellagio, and the politicians’ favourite resort, Cernobbio, and Lake Maggiore, with Hemingway’s favourite retreat, Stresa, and the peacock-peppered Isola Bella on Lake Maggiore, there are plenty of little villages left to explore along the smaller Lakes. We have chosen three you absolutely should not miss. God’s watercolour. That’s how Markus Werner calls Orta San Giulio in his book, Terraferma. Here, lake and sky are streaks of crystalline blue hemming in the scented pinks and reds of camellias and azaleas, and the stately baby green and creams of grand 18th century mansions. The entire village is a cavalcade along three hundred years of opulent architecture—from the Renaissance to the 18th century—in a triumph of wrought iron balconies, dark slate roofs and soaring arches. 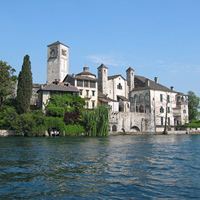 But Orta’s prettiest corner is the islet of San Giulio, which rises from the lake a few hundred yards from the coast. The islet has long had a mistic aura. Legend has it that it once was home to a dangerous serpent which destroyed anything in sight. But one day in the fourth century AD, Saint Julius of Novara reached the lake’s shores and, using his cape as a boat, reached San Giulio. His presence alone was enough to chase the serpent away, and the Saint built his hundredth church on the barren rock. Six hundred years on, another saint left his mark on the islet—Guglielmo da Volpiano, an early follower of Saint Benedict was born there. Over time, however, these religious heritage was overshadowed by a military role as the islet became the strategic seat of a fortified castle. Until the 19th century, when the sacred once again replaced the profane. 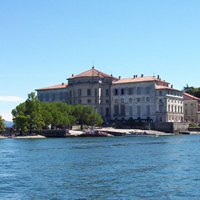 In 1842, a seminary was built on San Giulio, its cream white bulk taking up most of the islet. The seminary later became a monastery for cloistered nuns and today the islet is a place of peace, quiet and extraordinary beauty, which visitors can savour by staying at the monastery’s guest house. The church founded by Saint Julius in the 4th century is also open to the public. Although the Romanesque building has been lost, the later replacement preserves intact the spirituality of the origins. Lake Lagusello is tiny and the village that fronts it even more so. Castellaro Lagusella (Monzambano - Province of Mantua) is a fortified hamlet that presides over its own waters—a heart-shaped Lagusello, or small lake. Thick crenellated walls—broken up by a gate with a massive clock tower—have been sheltering Castellaro since the Middle Ages. Ancient homes of exposed stones line the maze of narrow, quiet lanes that coast by rich Baroque church to reach the small piazzetta that is the pulsating heart of the village. Here stands the grandiose bulk of the 19th century Villa Arrighi. The villa, which is now an opulent mansion, was originally Castellaro’s fortress and it shows—the towers, the fortified walls and the mullioned windows that overlook the emerald waters of the reed-lined lake have a distinctly forbidding look. But if the architecture and views aren’t enough, Castellaro offers some extraordinary salami and wine (Tocai and Merlot). A mountain in the middle of a lake. It is Monte Isola, hamlet, island and border between Lombardy’s Brescia and Bergamo provinces. This is a place where wild nature meets tamed landscapes of olive trees, orchards and pretty fishermen’s homes. First in sight are the handful of old homes and jetties of the aptly named Porto, the harbour where the ferry boat from Lovere docks. From Porto, a tiny lane—Monte Isola is a car-free haven—climbs up the hill towards Siviano, the island’s main village. Once Siviano was just a medieval castle, but it expanded into a hamlet over time. The stone bulk of the main tower, Torre Martinengo, is still there, standing sentinel over porticoed homes brimming with flowers. But it is now dwarfed by the graceful Neo-Classical church of San Faustino e Giovita, built at the very top of the hill that overlooks the village. Old country roads lead to the other Monte Isola villages—among others, Masse, with its stone homes, courtyards and a large stone rock that legend wants to be a meeting place for witches; Novale with its medieval houses and elegant palazzo, once home to the local bishop; and Peschiera, a lakeside hamlet graced by the exquisite Castello Oldofredi and the pastel-hued homes where most of the local fishermen used to live. And at the very top of the island, perched high on a rocky outcrop, the Sanctuary of the Virgin of Ceriola, has been watching over Monte Isola since the fifth century AD.